Use our Online Designer to customize your own License Plates. Advertise your business or show your pride for your favorite sports team. 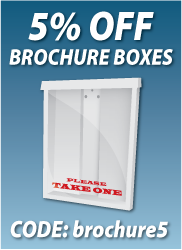 Standard 6"x12" size to fit any vehicle. 6"x12" is the standard license plate size. Our plates come pre-drilled so you can easily mount them to your vehicle. Aluminum is a thin, lightweight metal that never rusts. It is excellent for indoor and outdoor usage, making it ideal for a wide variety of applications. Our license plates come in the standard 6"x12" size and are pre-drilled to mount on any size vehicle.